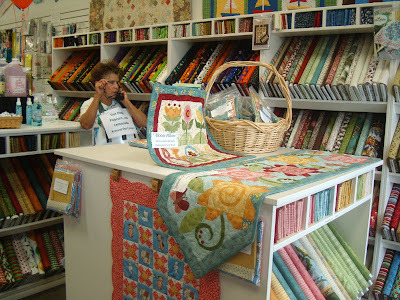 After Lori and I went to Material Girls yesterday, we Shop Hopped over to Quilts, Etc. in Sandy, Utah. We were greeted by the beautiful orange/peach roses over the fence in the adjoining yard. Quilts was celebrating The Super Bowl for there theme. 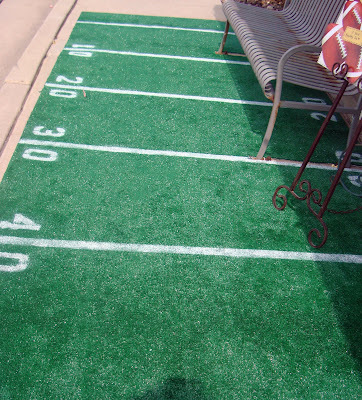 So they rolled out the green to welcome the Shop Hop guests to their store. The wonderful Sandra was on the phone when we got there. 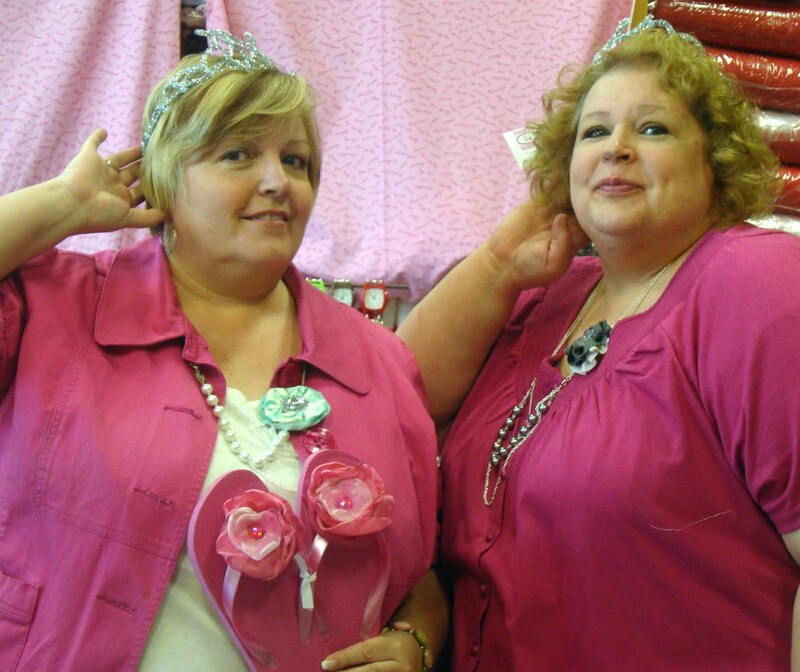 Sandra is in charge of the vintage Clothesline Club Tuesday meetings that Lori and RaeAnn go to there. 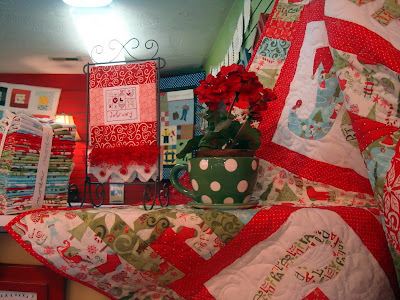 They had a quilt by Kari and her book displayed front and center. I'm always attracted to the reproduction fabrics. So cute. 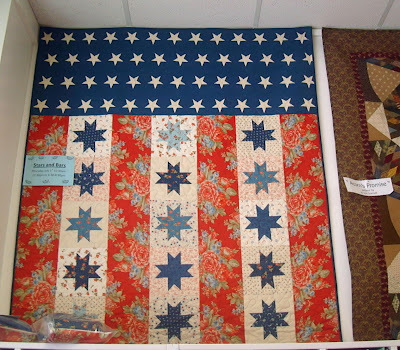 I thought this flag quilt was really beautiful. It is simple yet elegant. 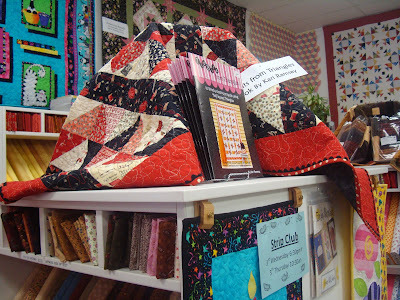 We had a great time at Quilts and the ladies were so friendly. They were even serving hot dogs in the parking lot like a tail gait party. But Lori and I were on a mission to get to the next store so we pushed forward. 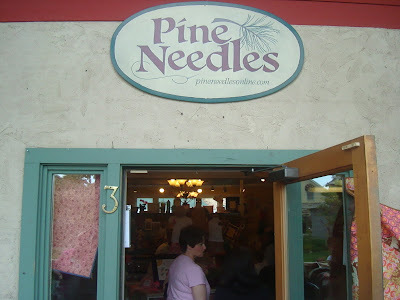 Next we went to Pine Needles located in Gardner Village in southwest SLC. If you visit the Salt Lake County area you must come to Gardner Village. 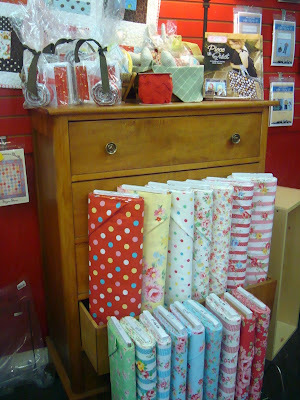 The quaint shops made in vintage cottages are really fun. There is a little pond and a great restaurant. There was so much to look at in Pine Needles. Wendy and the girls have been really busy getting ready. Of course the aprons caught my eye. Isn't this an incredible basket quilt. They had a really great line of Christmas fabric displayed and Lori and I snagged a few fat quarters from the display that will coordinate with Monica's Happy Holiday line when it is delivered to me Monday. Isn't that teacup cute. They got it at Hobby Lobby. Hmmm. I want that. And of course I can't keep away from the Lecien displays at the stores. I do have this fabric so I wasn't tempted to buy, mostly. But it is wonderful to look at. 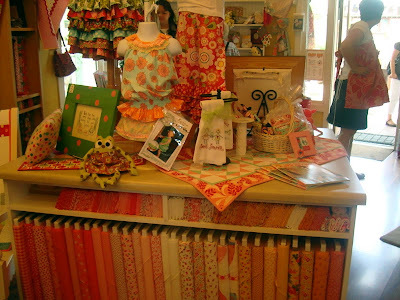 Every inch of the store contained things I would want to make. Isn't this quilt wonderful. I love it, of course. It has little girls clothes. It is just made so well and such a sweet design. This corner caught both Lori's and my eye. Isn't that quilt with the rick rack compelling. The pinwheel in the middle of the block makes the design really special. And the rick rack finishes it off so well. 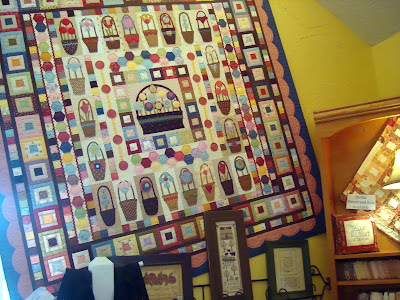 This is a great layer cake design in this quilt. Lori picked up the pattern to use with her Moda layer cakes. It looks like a fun quilt. Well that does it for Lori and me on the Shop Hop yesterday. Tomorrow after work I go alone to a couple more stores. I would like to get to Piper's in Sugar House too (maybe Saturday). I think the local stores are some of the best quilt stores in the nation. They really outdo themselves at Shop Hop time. 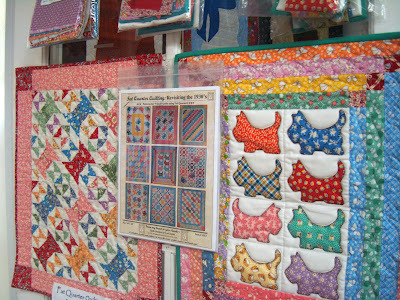 The display quilts around the shops are beautiful! 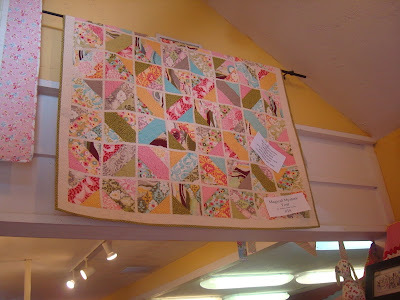 I'm especially smitten with the clothesline quilt. Thank you, Nanette for another set of lovely pictures! Hope you have lots of fun at the other stores too! 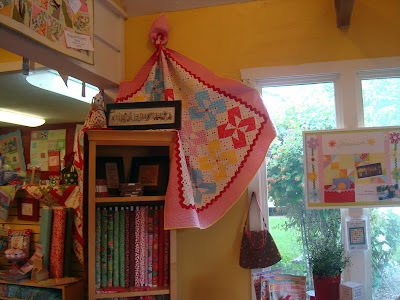 I'm in love with the clothesline quilt ... it's just fabulous!! Looks like you had a t'riffic time, did you buy a lot??? 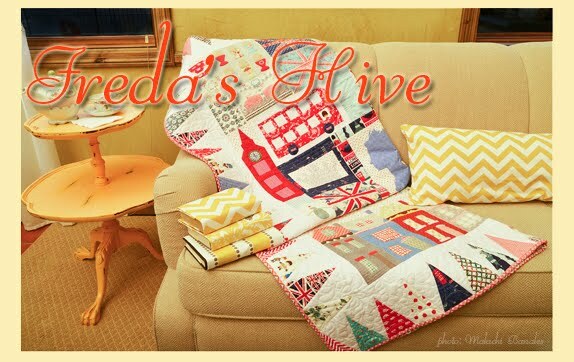 Love the last two quilts...do you happen to know the names of the patterns...and does Monica's fabric coordinate with 12 Days by Kate Spain? I'm ordering Monica's today! What fun Nanette...lovely eye candy. 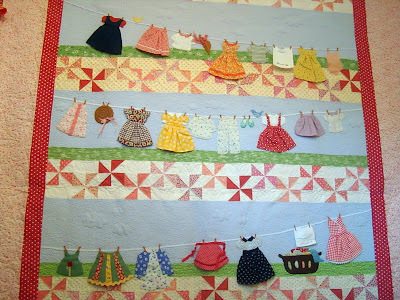 I too am inlove with the clothes line quilt..so sweet! Wow. What a great store. 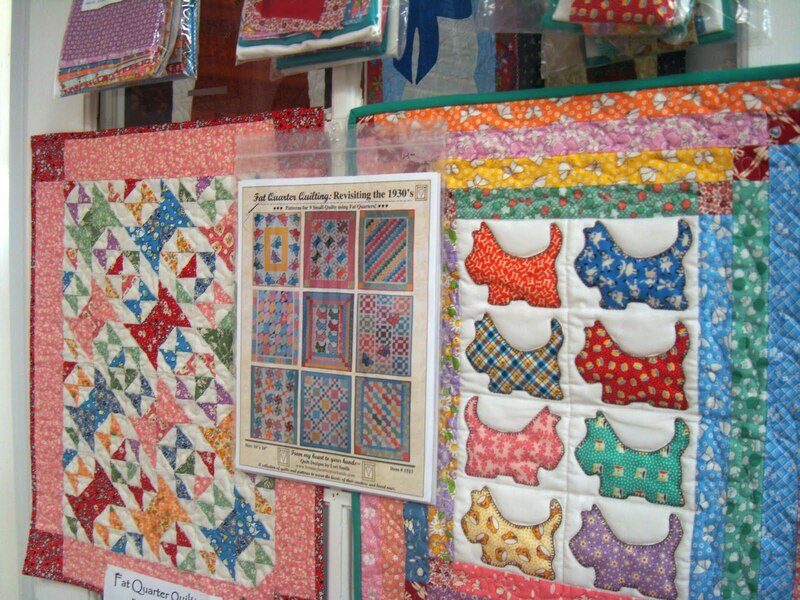 I would just be standing there, staring at all the gorgeous quilts, jaw open. 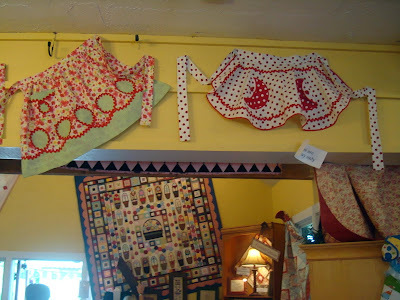 Isn't that clothesline quilt something?? You do have amazing stores in Utah!! My Happy Holiday is arriving next week too! Can't wait. Lots of quilt eye candy, Nanette! 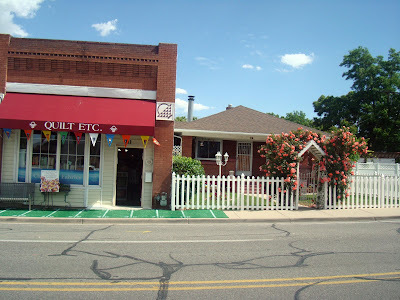 I wish there were a few more quilt shops in my area. There is a shop hop I think going on right now but I'm saving my pennies until next month's International Festival. oh, I'm so jealous that you and Lori have been having so much fun without me. 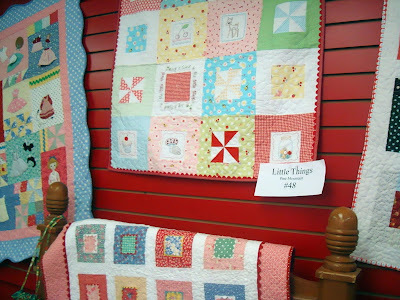 You saw so many wonderful quilts! Thank you for the show and tell. The bright side is I was able to see the Shop Hop through your eyes, and yet not spend any money. Wow, Nanette! I've just loved traveling along with you on your shop hop tour. 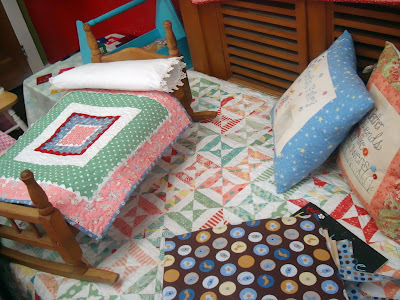 That clothesline quilt is fab and the flag quilt is just stunning. Looks like you had the best time. My jaw actually dropped a couple of times. What a lot of great ideas! You girls are having a lot of fun, aren't you! Good for you. What a fun quilt hop! Thanks for taking us along. I was there on Wednesday too!!! I ran into Kim. I was on my way to SLC to the FHL with my genealogy bud. It would have been fun to run into you two, too! I bought the Laundry Day pattern. Hugs! 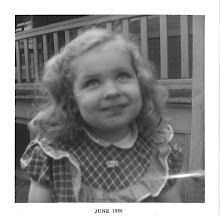 Nanette, was there a pattern name for the quilt with the little girl dresses? OMG! Loved every bit of this post. That quilt with the clothes on the line is just so cute. I love the basket quilt! !